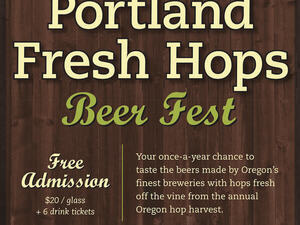 The 15th annual Portland Fresh Hops Fest is the state’s largest celebration of Oregon-brewed fresh hop beers and will present over 60 Oregon beers, each made with hops picked off the vine and used within hours of harvesting. Each brewery provides only one beer, so attendees are encouraged to arrive on Friday or early on Saturday for the greatest selection. Though the final beer list will not be available until closer to the fest, you can grab a sneak peek on the updated list on the Google Drive. In addition to beer, the Portland Fresh Hops Fest will also feature homebrew demonstrations from Portland U-Brew on Saturday from noon-5 p.m., a number of commercial vendors and on-site food from Urban German Grill. Entry on Friday is for only those that are of the legal drinking age. Minors are allowed on Saturday only until 5 p.m. Oaks Amusement Park is closed that day, but the train will be running from noon-5 p.m for kids accompanied by adults. Admission is free. Drinking packages cost $20 and includes a souvenir tasting glass and nine drink tickets in advance, or only six drink tickets when purchased at the door. Early purchase discounts available; see website.